Skin Cancer as we have read about the types of skin cancer and according to the types of skin cancer there have various risk factors and cause of skin cancer which led to development of skin cancer. Now the signs and symptoms of skin cancer depends upon the type of skin cancer. Signs and symptoms of skin cancer are different for different types of skin cancer and these types are Basal Cell skin cancer or carcinoma, Squamous cell skin cancer or carcinoma ans Melanoma. Basal cell carcinoma or skin cancer and these three different types of skin cancer has their own signs and symptoms and let us discuss about them one by one. 1. Pearly bump of pink or flesh colored :- If your body develops a pearly bump or lump of red, brown or flesh color, then it may indicate the basal cell skin cancer. 2. Bleeding sore that may return after healing :- If your skin develops sore and it bleed for unnecessary period of time then it may indicate any sort of abnormality in cells of skin and skin cancer too. 3. Hard white or yellow patch on skin :- If your skin experience any sort of patch coloring white or yellow that fells hard then it may indicate the skin cancer of this type. 4. Unclear pimples :- If you are experiencing pimples that are unable to clear indicate abnormality in skin cells and it may be skin cancer. 5. Red or brown patch that wont heal :- It is common to form patches on skin but if the patch does not heal then it may be skin cancer. 6. Waxy scars (white, yellow or skin colored) :- If your skin experience scars that appear waxy white, yellow or skin colored then you must visit doctor to check out the problem as it may be skin cancer. 7. Slowly growing group of red and pink scars type growths :- If your skin experience growth of group of tiny scars that grows slowly and may bleed on scratch indicate skin cancer. 1. 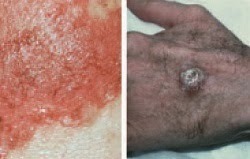 Reddish pearly bump or nodule that hardens :- If there is a bump on skin surface that hardens and does not heal. Then it may indicate skin cancer. 2. Open scar that may bleed :- If your skin has a scar that bleeds and it heals and again it occurs or start bleeding. It may indicate S.C.C. 3. Patch on lips :- If your lips experience patches white in color and it does not heal within a specific time period then it may indicate the abnormality in skin cells. 4. Hardening of lips :- If your lips harden and and doesn't heal then you should visit doctor as it may be skin cancer. 1. Mole on skin that grows unevenly or changes shape and color :- If your body experience mole that grows and changes its shape and size thus its a cause of concern and must visit a doctor to review. 2. 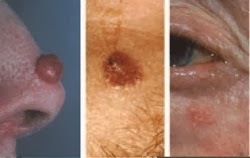 Dark spot that grows quickly :- If there is any black spot on the body that look like mole but grows quickly and doesn't heal on time may result in melanoma. 3. Black or brown streak under nails :- In some cases black streaks appear under finger and toe nails which represents abnormal skin cells and symptom of melanoma. 4. 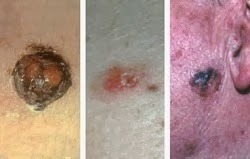 Bleeding unknowingly in new spots of skin :- If there is pain and bleeding at any new spot on the body unknowingly then there is a chance of melanoma.